Booking a serviced apartment helps you to save up to 54% compared to a hotel, depending on the destination. This is the result of the analysis published today by Acomodeo, which compares average hotel prices of provider HRS with the average prices of the serviced apartments listed on Acomodeo.com in 2018. For the study, data from around 40 cities, mainly in the GSA region, were collected and analyzed. The infographic illustrates the price comparison of the largest cities. What’s most interesting: While the hotel market is largely saturated and recorded a price increase in 2018, the market for serviced apartments is currently growing strongly and is therefore causing prices to fall in many areas. This is a great opportunity for companies and travel managers who want to save on travel costs but at the same time offer their employees more comfort. Those who book serviced apartments in the southern and south-western cities of Germany currently benefit most from favorable rates. 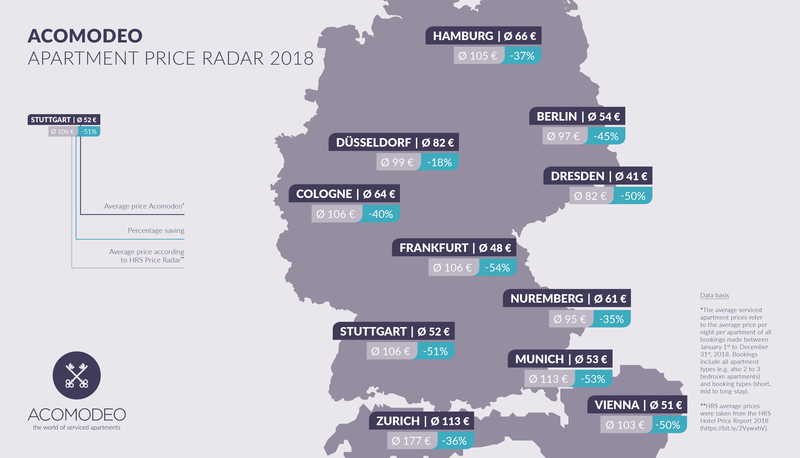 In 2018, especially in Frankfurt am Main (-54%), Munich (-53%) and Stuttgart (-51%) Acomodeo provided business travellers with the greatest savings compared to hotels. A serviced apartment costs an average of 48 euros per night in Frankfurt, 53 euros in Munich and 52 euros in Stuttgart. But also in high-priced Zurich (-36%), in Vienna (-50%) and in Berlin (-45%) the large selection of business apartments offers attractive options to save travel expenses. Travelers receive the most favorable price with 41 euros per night in Dresden, approximately 50 percent less compared to the hotel alternative. The most expensive of the destinations shown is Zurich with approximately 113 euros per night, but still around 64 euros cheaper than the corresponding hotel alternative. In summary, however, serviced apartments offer attractive conditions for all regions and cities: In 2018, Acomodeo customers were able to save between 20 and 54 percent on mid and long-stays by booking serviced apartments compared to conventional hotels. The annual study carried out by Acomodeo showed that 8 of the 11 cities shown recorded a reduction in average prices compared with 2017. 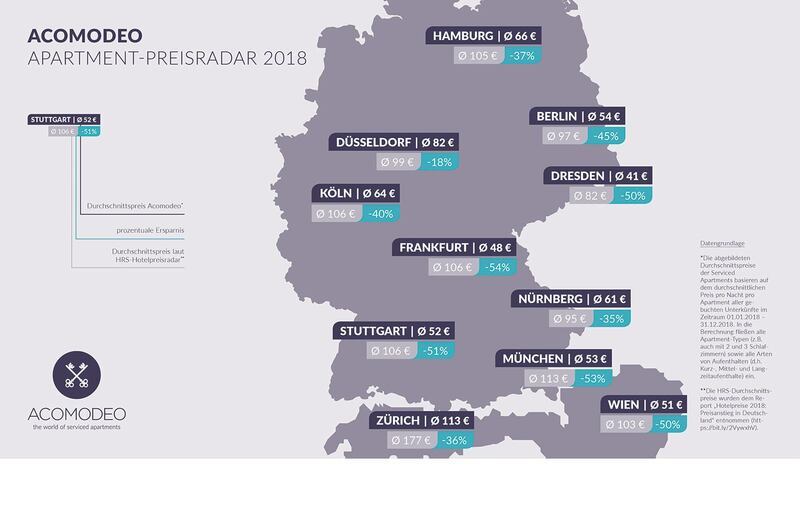 From 2017 to 2018, average booking prices in Frankfurt, Munich, Hamburg, Berlin, Dresden, Stuttgart and Vienna fell between 24 to 40 percent on Acomodeo.com. Only Düsseldorf, Nuremberg and Zurich saw an increase in average booking prices. This price development can mainly be attributed to the market entry of new providers as well as long-term price adjustments of existing providers. Especially in the newly emerging budget segment, which is characterized by a minimal service structure but maintained quality and can therefore offer lower rates, rapid growth is being recorded. These new, mostly very unknown, regional providers breathe fresh air into the serviced apartment market and are also an explanation for a falling average price. A recent industry report (GSAIR 2018/19) confirms this development. According to this study, 63 percent of serviced apartment providers stated in 2018 that they had already acquired new units this year. In addition, 79 percent of the providers reported definite plans to develop further inventory by the end of the year. With regard to the serviced apartment market, industry experts regard Germany, along with Amsterdam and Dublin, as one of the top 3 growth markets in Europe. For most customers, the most important reason for choosing a serviced apartment is certainly the great price. Responsible for this is the so-called degressive price model, which describes the price decline with increasing length of stay. In short: whenever you book a serviced apartment for a period of several weeks or even months, you benefit from particularly favorable conditions. Acomodeo enables customers to access these special rates online and even pre-negotiates them for companies. But also qualitative reasons convince Acomodeo customers to make a booking, as serviced apartments unite the comfort of furnished apartments with the proficiency of hotels. Guaranteed services include a cleaning service, free TV and WiFi, as well as towels and bedlinen among other things. In addition, serviced apartments have a spacious living area, a desk and at least a kitchenette, often even an entire kitchen. And this is exactly where serviced apartments hit the nerve of time: in recent years, the needs of business travelers have moved in a new direction. Especially on long-term business stays, employees no longer want to check into fancy but "anonymous" hotel rooms. Instead they favor a personal, authentic housing experience “like home”. This is where Acomodeo offers the perfect solution. In contrast to private and thus sometimes unreliable apartment owners (e.g. by booking via Airbnb), Acomodeo only lists professional operators with high-quality accommodation with professional payment services that correspond to most corporate business travel guidelines. The average serviced apartment prices refer to the average price per night per apartment of all bookings made between January 1st to December 31st, 2018. Bookings include all apartment types (e.g. also 2 to 3 bedroom apartments) and booking types (short, mid to long-stay). HRS average prices were taken from the HRS Hotel Price Report 2018 (HRS, 2019: “Hotelpreise 2018: Preisanstieg in Deutschland”).